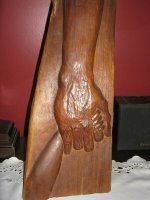 As a teenager I developed an interest in wood sculptures. I ultimately settled into doing deep bas relief. I do flowers for fun. My most cherished subject is hands. I use Black Walnut, a very hard and tight grained wood. Very often the wood defines the piece I will carve. My larger pieces are 1x2 ft. My second love is silver. I design and cast Sterling silver jewelry. My carving skills are used here as well. Each piece I make must first be carved from a very hard wax which is then used as the pattern for the piece. I have also started using antique bronze. Images from nature are found in many of my pieces as well as original Celtic designs. I incorporate a variety of stones in my work, lapis, tiger eye, onyx, cornelian, jade, and malachite.